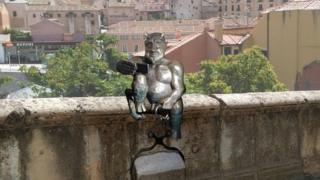 A planned sculpture of Satan in the Spanish city of Segovia has been criticised for being too jolly. The bronze statue was created as a tribute to a local legend, which says that the devil was tricked into building the city's famous aqueduct. But residents say that the devil - who is smiling and taking a selfie with a smartphone - looks too friendly. The artist told BBC News he was surprised by the level of criticism directed at his artwork. A judge has now ordered the artwork to be put on hold while he looks into whether it is offensive to Christians. More than 5,400 people - just over 10% of the city's population - have signed a petition calling for the sculpture to be cancelled. The petition says that because the devil is shown in a "jovial" way, with a phone in his hand, it "exalts evil" and is therefore "offensive to Catholics". It adds that Satan is supposed to be "repulsive and despicable - not kind and seductive, like that of the 'good-natured devil' without malice" that has been proposed. But the row has taken the artist, José Antonio Abella, by surprise. "It seems to me incredible that people would be so fiercely against the sculpture of a devil to commemorate a popular legend, taught to Segovian kids at school," Mr Abella, a former doctor who has taken up art in his retirement, told BBC News. "I love Segovia. I have lived here for three decades and I was hoping for this sculpture to be a form of demonstration of how thankful I am to Segovia for being my adopted town. "I haven't received any money whatsoever for this sculpture... I haven't done this for the money but as a personal tribute to the city I call mine. You can imagine how I feel." City Councillor Claudia de Santos has also called the campaign "unfair and disheartening". She told El Pais newspaper that she would try to ensure that the sculpture goes ahead as planned.